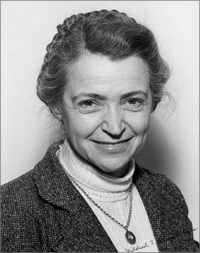 Mildred Dresselhaus was Professor of Physics, Emerita, professor of Electrical Engineering, Emerita, and Institute Professor, at the Massachusetts Institute of Technology (1960-present). Other institutional affiliations included the United States Department of Energy and Cornell University. Her research interests included high magnetic fields and condensed matter. November 11, 1930Birth, New York (N.Y.). 1951Obtained BA, Hunter College, New York (N.Y.). 1953Obtained MA, Radcliffe College, Cambridge (Mass.). 1958Obtained PhD in Physics, University of Chicago, Chicago (Ill.). 1958 – 1960National Science Foundation (NSF) Fellow, Cornell University. 1960 – presentResearcher, Lincoln Laboratories (1960-1967); Visiting Professor of Electrical Engineering and Computer Science (1967-1968); Professor of Electrical Engineering and Computer Science (1968-1973); Director, Center for Materials Science and Engineering (1977-1983); Abby Rockefeller Mauze Professor of Electrical Engineering (1973-1985); Institute Professor (1985-present); Professor of Physics (1983-present); and Professor of Physics Emerita and Professor of Electrical Engineering Emerita, Massachusetts Institute of Technology (MIT), Cambridge (Mass.). 1974 – 1976Member, Advisory Board, Materials Research Division, National Science Foundation. 1978 – 1984Chair, Steering Committee on Evaluation Panels, National Bureau of Standards. 1980 – 1984Member, Science Advisory Committee, Allied Chemical Corporation. 1984 – 1988Member, Governing Board, National Research Council. 1984 – 1990Member, Energy Research Advisory Board, United States Department of Energy. 1987 – 1990Chair, Engineering Section, National Research Council. 1990Awarded National Medal of Science. 1998President, American Association for the Advancement of Science. 2000 – 2001Director, Office of Science, United States Department of Energy. 2003 – 2008Chair, Governing Board, American Institute of Physics. 2004Awarded Founders Medal, Institute of Electrical and Electronics Engineers (IEEE). 2008Awarded Oliver E. Buckley Condensed Matter Prize, American Physical Society. 2010Awarded Enrico Fermi Award, United States Department of Energy. February 20, 2017Death, Cambridge (Mass.). Both employed at Cornell University and Massachusetts Institute of Technology (MIT). Visiting Professor of Electrical Engineering and Computer Science, Professor of Electrical Engineering and Computer Science, Director, Center for Materials Science and Engineering, Abby Rockefeller Mauze Professor of Electrical Engineering, Institute Professor, and Professor of Electrical Engineering Emerita. Professor of Physics and Professor of Physics Emerita. President and awarded 2008 Oliver E. Buckley Condensed Matter Prize. Member, Governing Board and Chair, Engineering Section. Member, Energy Research Advisory Board and Received 2010 Enrico Fermi Award. Chair, Steering Committee on Evaluation Panels. Obtained Ph.D. in 1958 in Physics. Oral history interview with Mildred S. Dresselhaus, 1976 June 7, 15, August 11, 19, September 13, 20, 22, 24, 30, and October 15. Reflections on a career in science and technology [sound recording] / 1989 January 25. Marie Curie - A 150th Birthday Celebration [sound recording], 2017 March 16. Oral history interview with Bunny Clark, 2004 June 7. Women in science and engineering oral history collection, 1976-1977.